Welcome to Ward 5 Online: "The Secret Garden" - performed by Somerville Public School Students! "The Secret Garden" - performed by Somerville Public School Students! Need a little musical theater in your life? 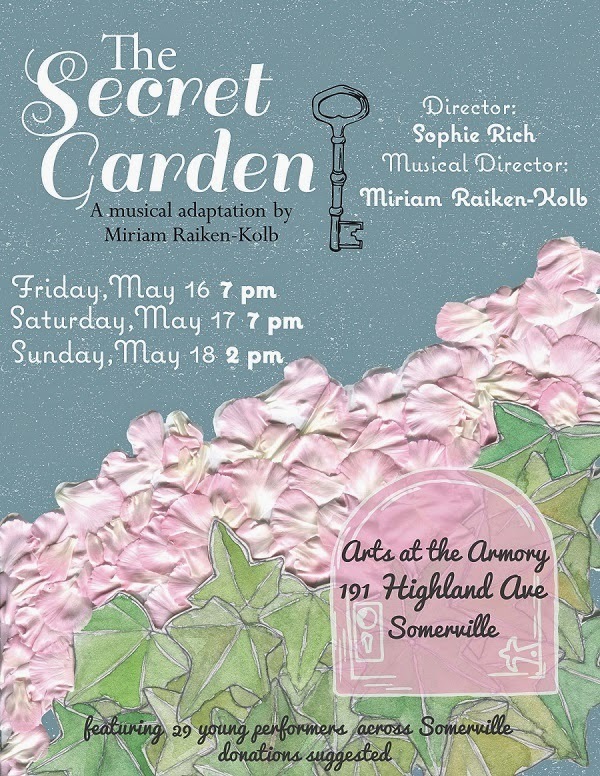 Then stop by The Armory this weekend for a production of "The Secret Garden" - performed by Somerville Public School school students! This musical production, written by Somerville resident Miriam Raiken-Kolb and directed by Sophie Rich, features 29 children from Somerville in grades 2-8. Tickets are free or whatever you can donate! Mary Lennox's world changes when, after losing her parents, she is sent to live with her reclusive uncle. Mary soon discovers that there are many secrets behind the garden walls and locked doors -- and by working to bring her late aunt's special garden back to life, she mends her own heart and the hearts of those around her.